Anyone know if this pond, on Sharon Station Road, has a name? It's a bit to the east of where the Rail Trail crosses. That would be Sharon Station Road in Amenia. 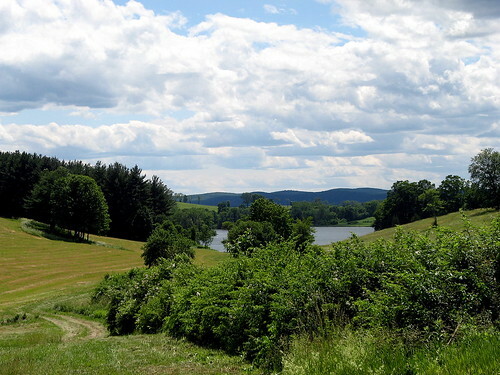 It's Round Pond, which used to be part of Joe McEnroe's farm until he sold it a few years back. The town of Amenia beach used to be there until it was closed in 1997 because of e-coli contamination, presumably caused by cow manure run-off. Indeed, some of the old timers told me, once upon a time, they recalled seeing children actually swimming with the cows. I guess it's over the state line but it's not exactly clear when yu cross from Sharon into NY going either on Sharon Station Road or Coleman Station Road. That spot is just around the bend from where the two split off, not a half-mile from the Sharon ballfields. Anyway, thanks! You're welcome. The state line on Sharon Station Road is just beyond the public housing project which I believe is called Sharon Ridge. It's my favorite spot in the whole world and one I recently painted for my sons... I swam with them in that pond- I thought the e.Coli, that closed the town beach, was from the tons of goose poop!